The publication aims to provide a more in-depth overview of existing definitions, prevalent categorisations and models that are currently being used to describe the relief to development contiguum in the WASH sector and identify existing challenges and opportunities that come along with it. It looks into the main disaster and crisis scenarios and how they affect the WASH sector. It provides definitions for the different assistance types (relief, recovery and development) and the role that WASH plays in each of them. It furthermore summarises main concepts and approaches that are being used and makes an attempt to map out the complex structures and funding mechanisms in both relief and development and identifies existing challenges and opportunities in the transition contiguum. For this paper a wide range of sector professionals have been asked to provide feedback reflecting either their individual and/or organisational views and experiences regarding current challenges, opportunities as well as recommendations for the way forward. The publication should be seen as a current snapshot of the sector at the interface between humanitarian assistance and development cooperation. It intends to foster the mutual understanding of each other’s field of work and provides impulses for fuelling the on-going international debate on how to better link relief, rehabilitation and development in the WASH sector. 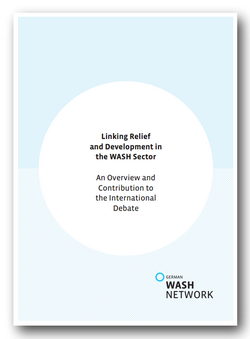 The publication can be downloaded under the following link: http://www.washnet.de/wp-content/uploads/2014/07/washnet_wash-relief-to-development_2014.pdf (PDF, 4.1 MB).